How many dental patient referrals did your office receive last week? None? A few? Press play and find out how to boost your numbers, today. In this week’s Wednesday Wisdom, Jen shows you why it’s crucial that your team is asking for dental patient referrals on a regular basis. It’s the MOST cost-effective way to generate new dental patients. 2) Who doesn’t like a little incentive now and then? Check your state board regulations about incentivizing a patient. If you live in a place that’s A-OK with it, then you’ll want to press play now to learn how to use incentives to boost your dental patient referrals. 3) Create a system that your team can easily follow for kindly asking for dental patient referrals. Don’t send them out there blind and unsure of what to say. It’s not going to help, and it could hurt your cause! Jen: 00:01 Let me ask you a question. 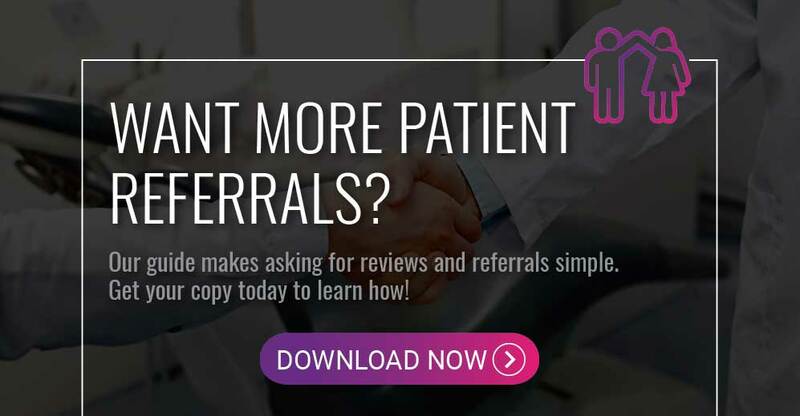 Are you asking your patients for referrals every day? If you’re not, you should be. I’m sure you’re probably thinking, “I don’t even know where to begin.” I’m here to tell you how in three easy steps in today’s Wednesday Wisdom. 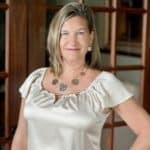 Hi, I’m Jen Bernstein, senior account executive at Golden Proportions Marketing. For 10 years I’ve been talking to my clients about the number one most cost-effective way to generate new patients, and that is asking for referrals. Jen: 00:28 Number one, develop the program. Make sure that you have some internal marketing support to promote the program. This very easily can be some displays or posters placed around the office, maybe in all the treatment ops, maybe in your reception area, maybe at your concierge counter. Don’t forget to also have something tangible in hand to hand the patients when you make the ask. This can very simply be a branded business card or maybe a plastic gift card to the practice. Jen: 00:52 Also, don’t forget to market the program. Make sure you add a call up button to the homepage of your website. Also, make sure to put it out on your social media, maybe send out a monthly e-blast, the whole idea is to market the program. Create an awareness for those patients that have yet to come into the practice or a reminder for those patients who you’ve already made the ask. Jen: 01:09 Second, incentivize your patients. I must caution that you have to be aware of your state board regulations. In some states, they do not allow you to incentivize a patient, so you need to figure out what works for you. The workaround is that you could very easily come up with a monthly giveaway, something that as the patients refer to you, they get entered into a monthly drawing. Jen: 01:28 The price can be anything from gift card to a local restaurant, could be car detailing, could be a family event, et cetera. At the end of the day, don’t forget about the new patient as well. You’re going to want to maybe offer them a free whitening, maybe a free electric toothbrush, maybe a fabulous new patient special. Jen: 01:47 Third, come up with the system. Make it a priority during your morning huddle to identify each patient coming in that day. Determine which team member will make the ask so that in doing this, you will eliminate what I call the double dip. No other team member will mistakenly ask the same patient as you. This will also hold the team accountable for their part in growing your practice. Jen: 02:07 Remember, it takes 90 days to make it a habit, just like going to the gym. If you feel the team is losing momentum in asking for referrals, turn this program into a competition. Have each team member place their initials on the back of the card. At each monthly meeting, determine how many cards were returned per team member. A little competition never hurt anybody, right? Jen: 02:28 I’m sure you’re wondering, “How do I remember all these great tips?” That’s easy. Go to our website, www.goldenproportions.com, download our free marketing tool patient referral tips. Thank you for watching this week’s edition of Wednesday Wisdom.